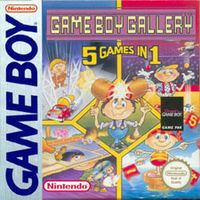 Game Boy Gallery is a video game released for the Game Boy in Europe and Australia in 1995. It is a compilation of five Game & Watch games with upgraded graphics and sound. Unlike the later Game & Watch Gallery games, there is no option to play a port of the original games, and the games do not feature any characters from the Super Mario series. There is also no internal battery inside the cartridge to save the high scores in the game. The games included are Ball, Vermin, Flagman, Manhole, and Mario's Cement Factory (titled as Cement Factory). "The original Game & Watch introduced millions of people to the world of Nintendo. Now Nintendo has put five of these classic titles onto one Game Boy cartridge to ensure maximum fun and frustration for players of all ages!" This page was last edited on 2 October 2011, at 23:38.